Le cap Bear : very beautiful views of Port-Vendres, the vermeille coast and cap Creus. Cospron : a picturesque hamlet built on a hill in the middle of the vineyards. Its chapel contains a marine christ (crowned with ropes and not thorns). Vinaigrerie de la Guinelle : artisanal production of banyuls vinegar. Collioure : walk along the d114, discover the panorama, the cornice, the beaches and the château Saint Elme. The listed site anse de Paulille has been protected since 2008. Many activities, exhibitions and events are organized in the former Nobel dynamite plant. In this area steeped in history, you will find a magnificent Mediterranean flora and beautiful wild beaches that are guarded in season. Here the Pyrenees plunge into the Mediterranean, we are at the eastern end of the chain. The Cap Béar is located in the heart of the Gulf of Lions Marine Natural Park. The site is accessible by foot from Port-Vendres, it is a beautiful walk along the cliffs of the north coast to the semaphore. The cape still retains many remains of the defences put in place by the Germans during the Second World War. For hiking enthusiasts, the coastal path will allow you to admire the rocky coast of the alberes, which is part of the Natura 2000 network. You will discover many rare and protected animal and plant species. 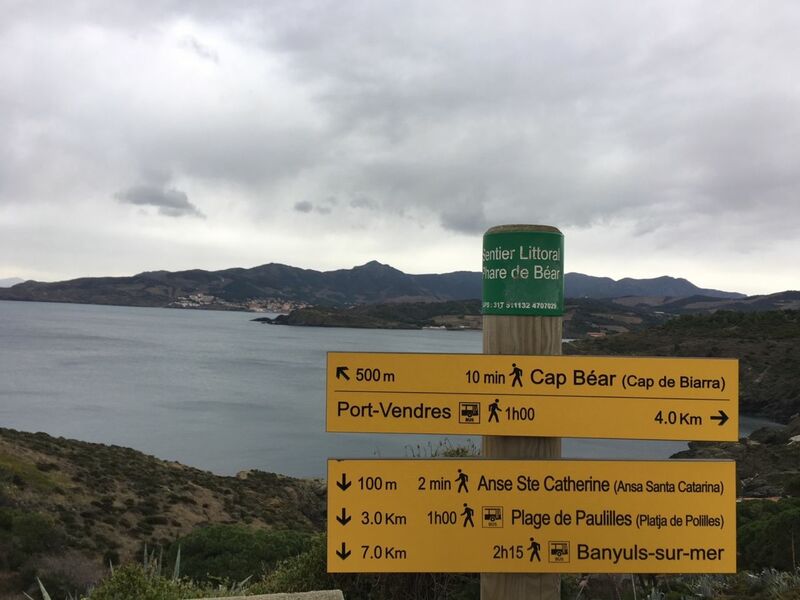 An invitation to walks, the many sites accessible by foot from Port-Vendres. View of the Banyuls marine reserve and the horizon, Cap Creus in Catalonia on the Spanish side.